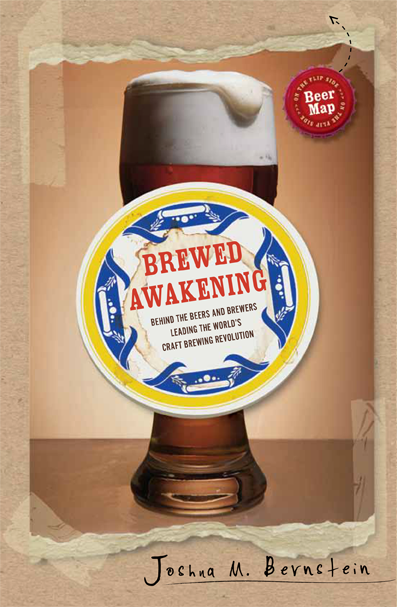 Author Joshua Bernstein will be in town this Friday and Saturday to promote his new book Brewed Awakening: Behind the Beers and Brewers Leading the World’s Craft Brewing Revolution at three events. During growler hours at Foggy Noggin Brewing, I will be tipping back delicious pints of Jim’s British-inpired brews, as well as signing books. Come meet the brewers at one of the Pacific Northwest’s best nanobreweries. Why Brewed Awakening? Concerning beer, the last decade has witnessed more seismic changes than any time since Prohibition. There are more than 1,700 craft breweries in America, from community-based nanobreweries to the new breed of national brands such as Dogfish Head and Stone. Untethered from stodgy tradition, and driven by unbridled creativity, American and international brewers are leading a boundary-less charge into the global future of beer. The bitter India pale ale has birthed the burly, super-aromatic double IPA. Alcohol percentages have climbed above ten percent, on par with wine—and now join Pinot noir at dinner tables and on tony restaurants’ drink lists. Wild yeasts have been harnessed and are used to inoculate beers that, in the best way possible, taste like a barnyard. Naturally carbonated cask ales have now achieved cult status. And brewmasters have begun aging their creations in wooden casks that once contained bourbon, brandy, chardonnay, and even tequila, reviving techniques last seen more than a century earlier. I’ve spent the last six years covering the craft beer industry, traveling from Asheville to Austin, San Francisco to Chicago, Portland to Portland. I’ve hit breweries. Interviewed brewers. And spelunked deep into the people and the trends driving the craft beer revolution. There’s a story in every pint glass. I give voice to them. Looking forward to getting my copy of Brewed Awakening at Foggy Noggin Sat.